English major Cole Waldron walks through the exhibition looking at all the student works of art on Tuesday, Nov. 29, City College East Campus green house. The student art exhibition was called "Garden Observations" and had various student art works on display. 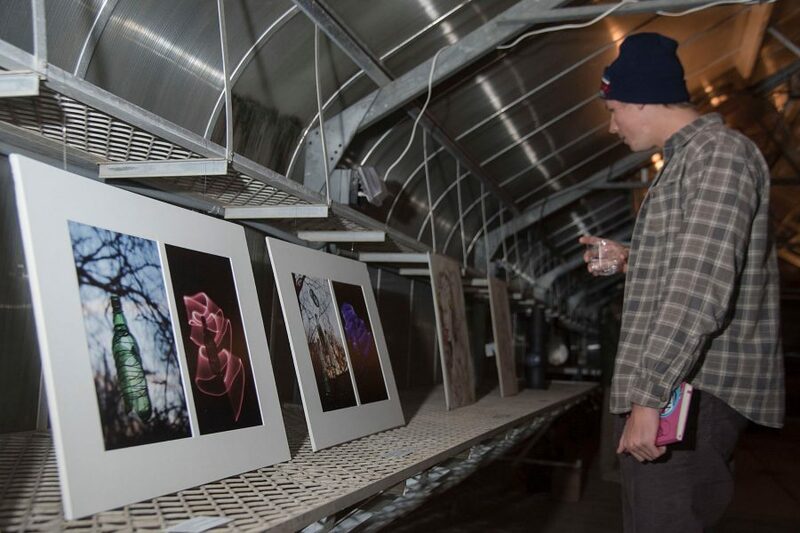 As the fall semester comes to an end, 15 extremely gifted City College students have been chosen to display their visual art in the Environmental Horticulture greenhouse on East Campus. The diversity these students have shown in this very brief exhibit the curators have titled, “Garden Observations,” is something they can really be proud of. The artists used ceramic, charcoal, graphite, acrylic, stencils, watercolor and oil paints, along with many other artistic mediums. 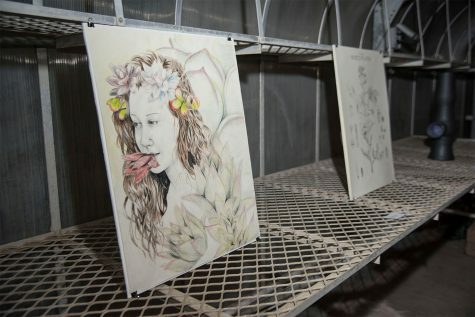 The art was set in two long lines on each side of the greenhouse for the few dozen people who came to the exhibition to admire up close. The practically outdoor event started at 5 p.m. Tuesday, and will be open daily from noon to 4 p.m. until Friday, Dec. 2. The curators for the exhibit are Christina Marquez and Emily Corb, City College students, and Atkinson Gallery interns. Marquez studies poetry and screenwriting. Corb, whose art was also displayed in this week’s event, studies intermediate drawing, printmaking, and photography. The two also helped Devon Tsuno, Los Angeles artist and assistant art professor at Cal State Dominguez Hills, set up his “Los Angeles River: Urban Reclamation” exhibit, which has run the entire fall semester at City College in the Atkinson. The students who participated in “Garden Observations” have definitely given Tsuno a run for his money. Especially artist Deborah Bradbury, who, like Tsuno, used bright acrylic colors on canvas for her painting, “The Moths.” Bradbury’s 4-by-2-foot painting shows a bright orange sky towering over green and lavender foliage, which leads to the silhouette of a wooden fence painted way off in the distance, while a few moths hover amid the naked branch of an anorexic tree. It wasn’t only Bradbury and her bright colors that stood out. Sarah Starks kept her colors to black and white and showed she too possesses the ability of a pro. Starks used India ink on paper to paint her piece she calls “Sometimes All You Can See Are the Shadows of Reality,” which was not half the size of Bradbury’s piece, yet just as alluring. Starks black leafless branches tangled on a snow white sky, with little black dots falling like charcoaled rain is all the painting had, and all the painting needed to prove that, in her case, less is more. But it was Corb, one of the event’s faithful curators, whose art stole the show, and possibly the entire semester. Corb’s 4-by-foot nameless drawing of a pale faced woman with pink and blue succulent plants weaved into her stringy hair, with red petals held between her lightly shaded lips, was by far the most elegant piece of art I have seen in some time. It made me think of Brooke Shields in Blue Lagoon, or the Coppertone baby all grown up. The unnamed art piece by Emily Corb is one of the many works on display on Tuesday, Nov. 29, City College East Campus green house. The student art exhibition was called Garden Observations and had various student art works on display. I truly believe that all the participating students have the ability to work hard, and pass up artists like Tsuno to become the next Frida, Dali, Manet, or Banksy. But in the case of Emily Corb, I see more than a semester long exhibit at a junior college. I see New York, France, L.A. But most importantly, in Corb’s future, I see the most conversant form of immortality when it comes to a true living artist.